Export Lotus Notes NSF Emails to MBOX in bulk. Preserve Metadata of Lotus Notes Emails after conversion. 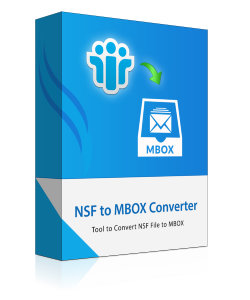 Convert Unlimited NSF file to MBOX without any limitation. Compatible with Latest Windows 10 and all other below version of it. The Lotus Notes to MBOX Converter Software allows you to convert nsf file to mbox file format with attachments. It converts complete attributes of nsf emails to mbox format without losing and data and preserves the integrity as well. The resultant mbox file can be easily in email client s such as Thunderbird, Eudora, Entourage, SeaMonkey etc. The Lotus Notes to MBOX tool is fully packed with high-quality features that help to simulate the conversion of each nsf emails to single mbox file such as for Drafts the resultant file having the extension Drafts.MBOX. The Similar process is carried out with another nsf file as well. The Default folder structure of Lotus Notes remains intact while performing the conversion of nsf file to mbox. The software does not make any changes in the folder formatting of NSF emails. This feature is optional, so you can opt this for maintaining the folder structure otherwise, by default tool maintains the folder hierarchy. Sometimes there is need of the user to only convert selected emails which are most required by him. With respect to that need, the software provides the functionality to export only selected nsf emails. For this you have to select the desired NSF file and export it to mbox file format with related attributes. The Lotus Notes to MBOX Converter Software provides the added facility to migrate lotus notes to Domino server to mbox file format merely by proving domino server credentials such as IP address and the password. The software does not save or leaks user credentials. It performs the operations in the complete isolated environment. In most of the cases, it has seen that nsf file is secured with the password to add extra security to messages. But while converting nsf to the mbox file format the software provides the facility to remove encryption from nsf mails. The software provides the extensive supports to the custom mapping of the folder to folder when migrating lotus notes nsf files to mbox files. With help of this feature, you can directly map the Lotus Notes NSF inbox to any newfile.mbox. This feature allows users to automatically detect & replace the canonical name of the sender's emails to SMTP format according to user defined Domain name. The user can also perform the email address translation using the CSV file option or manually. This feature provides the extra flexibility to users by providing them ease to filter out emails within specific date of range. This will allows sorting emails between the required date range specified by the user. The Doclinks contains the hyperlink of another document. The Software provides the enhanced functionality to retain the doc links same as the original file while exporting nsf mails to the mbox file format. The Software provides you the enough freedom to save the resultant mbox file at desired location or the location that is most suitable for user to store the mbox file format. The Lotus Notes to MBOX tool provides you the facility to create the new folder using the software panel itself and save resultant mbox into it. If you have multiple NSF files and want to convert it to mbox at once. In this case, the Lotus Notes to MBOX Converter is helpful to you. It allows you export bulk nsf emails to mbox file format directly. The process is simple, you have to only select the folder containing the multiple NSF file and then export it. Demo version of Lotus Notes to MBOX Converter Software allows Converting and saving first 25 Items from each folder. Support:Windows 7, Windows 10 &amp all below versions of Windows. Processor:1 GHz processor(2.4 GHz is recommended). RAM:512 MB of RAM (1GB is recommended). Disk Space:5 MB of free disck space. What is the file size limit of NSF file to Export to MBOX? There is no file size limitation to export nsf emails to the mbox file format. But when you are using the demo version of the software, it imposed a limitation on the file to export into mbox format. Is this application is compatible with latest Windows OS? Yes, The Software is compatible with the latest Windows OS and all the below versions. Any external application required to view the resultant mbox file? Yes, to view the content of the mbox file you will definitely require an external application configured on your system to view the content of the mbox file. Does the software maintain the folder hierarchy after the conversion? Yes, For sure the software maintains the folder hierarchy of the NSF file after the conversion. Is Lotus Notes Installation necessary to convert nsf to mbox? Yes,The Lotus Notes Component must be installed in local machine to carry out the process. The Lotus Notes to MBOX Converter is one of the simplest software to convert nsf file to mbox. The Graphical user interface of the software is so simple and easy to use that even people like me attain expertise in operating tool. I effectively export my nsf emails to mbox file format without loss of any data. The best part of this software is that you can save your resultant mbox file at the desired location and it also allows you to create the new folder using the software panel itself. I have used this tool to export bulk nsf emails to the mbox file format. I feel happy to use this software. The simply brilliant in his work. The tool allows me to complete folder containing multiple nsf file and export it simultaneously to mbox file. The resultant mbox is resembled the complete file structure of nsf emails after the conversion to the mbox file format.